This cake. 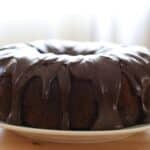 Hershey’s Chocolate Cake is truly the most versatile and easiest perfect one bowl chocolate cake recipe I have ever made. For years, I’ve seen the well-known chocolate cake recipe on the side of the Hershey’s cocoa box. On a whim, I decided to try making a gluten-free version of the Hershey’s Cake a few weeks ago. There is nothing quite like having a lightning fast homemade cake recipe that turns out perfectly every single time. The cake is sturdy enough to hold together in layers, as cupcakes or to slice as a bundt cake. I’ve made this as cupcakes and topped them with Fresh Strawberry Frosting. I’ve made a layer cake filled with the strawberry frosting, a layer of berries and then topped with the chocolate frosting. I’ve made two bundt cakes and simply poured the warm frosting over the cake. Every way I’ve served this cake, it has disappeared in no time at all! 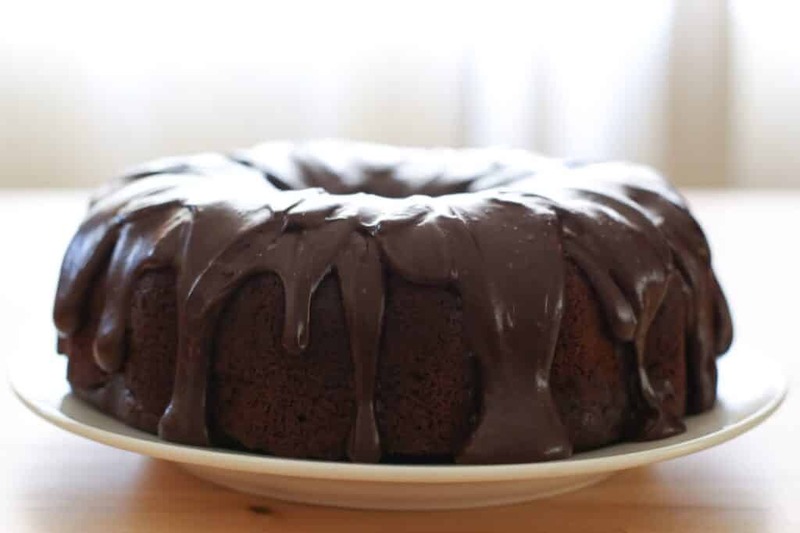 Nothing sparks that warm fuzzy feeling like the aroma of chocolate cake baking in your home. Put something chocolatey in the oven and watch as all the members of your family suddenly flock to the kitchen like moths to an iridescent light. Don’t get me wrong. I love an adventurous dessert ( hello, Flourless Hot Chocolate Cake) and sometimes you need an elegant showstopper like Chocolate Lava Cakes to wow a table. But at the end of the day, it’s hard to beat the familiar pleasure of a simple homemade chocolate cake. The original version of this recipe has been on the side of the Hershey’s unsweetened cocoa box for decades so chances are you grew up eating this cake or something close to it. There’s something fun and a little magical about recreating a familiar dessert from childhood! And if you didn’t get to experience this deliciously perfect chocolate cake as a kid, now’s your time. Living without gluten shouldn’t mean having to live without enjoying a classic Hershey’s chocolate cake, which is why I devised this gluten free version. For an ultra rich gluten free chocolate cake, be sure to try The Best Gluten Free Chocolate Cake too! This recipe makes killer cupcakes as well! Simply fill two cupcake pans evenly with batter and bake for slightly less time than you would a sheet or bundt cake. 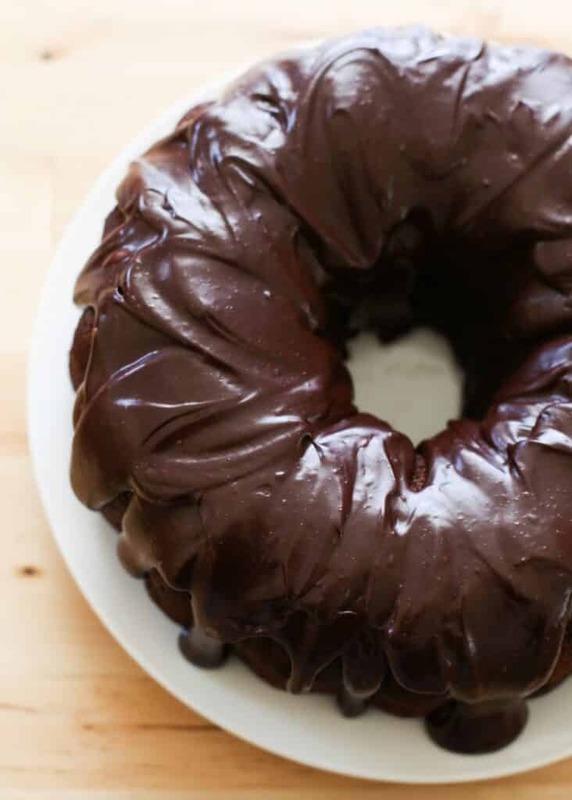 This Hershey’s Perfect One Bowl Chocolate Cake recipe includes directions for making a creamy chocolate icing that you pour over the cake once cooled. It’s an easy way to create a visually appealing cake without a ton of extra fuss. That said, this cake is an amazing vehicle for all kinds of frostings. Fluffy Chocolate Buttercream Frosting would be a dream on top of this Hershey’s cake, as would Fresh Strawberry Frosting. Make this one bowl cake over and over again and have fun experimenting with different toppings. Check out all of the Gluten Free Dessert Recipes on this site! Stir together all of the dry ingredients in a mixing bowl. Add the eggs, milk, oil, and vanilla and beat with a mixer on medium speed for 2 minutes. Slowly pour in the boiling water and continue stirring to combine. The batter should be very thin and watery. Pour into prepared bundt pan or divide between two round pans or cupcake holders. Bake the bundt cake for 35-40 minutes, until a toothpick inserted comes out clean. (2) 9″ rounds will bake in 30-35 minutes and cupcakes will bake in 22-24 minutes. Cool completely. Remove from the heat and add the chocolate to the hot cream. Let this sit for a few minutes. Stir or whisk to combine, until the chocolate mixture is smooth and glossy. Add the sugar and cocoa powder and stir until completely smooth. Pour the frosting over the cooled cake. Serve immediately or place the cake in the refrigerator to chill until the frosting is set. Stir together all of the dry ingredients in a mixing bowl. Add the eggs, milk, oil and vanilla and beat with a mixer on medium speed for 2 minutes. Slowly pour in the boiling water and continue stirring to combine. The batter should be very thin and watery. Pour into prepared bundt pan or divide between two round pans or cupcake holders. Bake the bundt cake for 35-40 minutes, until a toothpick inserted comes out clean. (2) 9" rounds will bake in 30-35 minutes and cupcakes will bake in 22-24 minutes. Cool completely. Heat the cream on the stove-top over low heat until steaming, or in a medium size glass bowl in the microwave until simmering. (About 2 minutes at high heat was all it took in the microwave.) Remove from the heat and add the chocolate to the hot cream. Let this sit for a few minutes. Stir or whisk to combine, until the chocolate mixture is smooth and glossy. Add the sugar and cocoa powder and stir until completely smooth. Pour the frosting over the cooled cake. Serve immediately or place the cake in the refrigerator to chill until the frosting is set. Enjoy! The ingredient list looks lengthy at first glance, but trust me when I tell you that this is a very simple recipe. The cake is all made in one bowl and it comes together in minutes. You can frost this cake however you choose and know that it will be delicious! Tried this recipe and it turned out delicious. I never thought a gluten free cake can be so good! So soft fluffy,moist and literally melts in mouth. It's worth trying! Would this work with Bob's Red Mill All purpose GF flour substituted for the items that are starred? I haven't tried that myself, so I can't speak to how it will work. It's certainly worth a try. If you try it, let us know how it works.